Flight planning is as easy as tapping in your point of departure, arrival and winds! - Fast database search and lookup of waypoints. - Search function lets you search for an airport using its identifier, name or city name. - Stores your favorite aircraft cruise performance numbers. - Quick Charter Quote feature, $/Sm or $/Hour. - Sunrise/Sunset and Azimuth feature. - METAR and TAF weather access. - 55,000 Airports and Navaids included (offline). - Save your own user waypoints. Originally published in 1999, this version conforms to the iPhone interface but retains the familiar look, feel and format of the original FlyBy Nav. If you used FlyBy Nav before, then you should feel right at home with the iOS version. We have faithfully reproduced the menu order and input/output screens. -Map feature that will display your route on a Google Map. -Search waypoint function now lets you search for waypoints and view their location immediately on a map. -Font “zoom” feature for easy reading of waypoint information. -Waypoint information now includes frequency’s. -Quick METAR and TAF weather access for departure and arrival airports. Note: FlyBy Nav is a single leg, great circle, flight planning aid. The aircraft performance data does not include taxi, climb or descent data. The waypoint data file contains public domain user generated data and may contain errors. 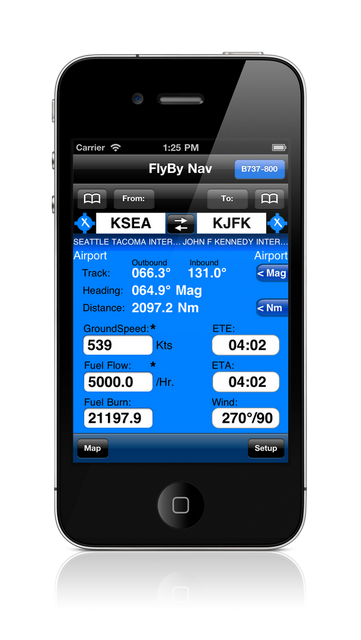 FlyByNAv is an excellent program for quick and painless flightplanning. Don't forget to also check out the new FlyByE6B. It gives you all the calculations the good old E6B-wheel do, plus advanced calculations as point of no return and critical point. It also has a handy vertical nav section and the always nice to have conversion screen. Easy to use interface that gives you all the options in one screen. Still in beta version, this is so far the best E6B-replacer I have seen yet. I use it every day, flying searh and rescue helicopter. A great program. Just what us pilots need! I would recommend it to anyone who fly's. It is simple to use and provides you with all the info needed for a flight in one quick place.